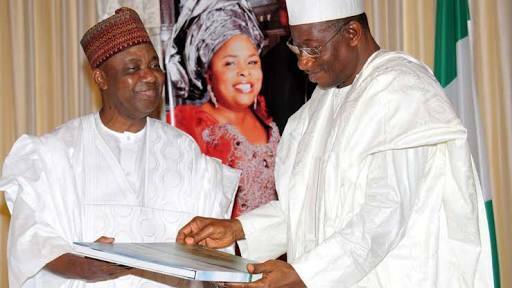 Speaking while paying a condolence visit to the country home of Bayelsa state Governor, Seriake Dickson, who lost his mother recently, former Vice-President Namadi Sambo said that he has no regrets serving the country as its vice-president under the Goodluck Jonathan administration. A statement by Dickson’s Special Adviser on Media Relations, Fidelis Soriwei, revealed that the former VP had cause to glorify God for giving him the opportunity to serve the country in the exalted position of vice president. Sambo, who said that he had just been appointed an active Ambassador by Afrexim Bank and the African Union, for an intra-African trade fair in Cairo, Egypt, called on the Independent National Electoral Commission to do the right thing in the forthcoming election of 2019. He said, “I have no regrets serving Nigeria. There is no cause for any regret. I thank the Almighty Allah that he gave me that opportunity to serve our country.